Anton became a first-degree member of The Knights of Equity on 10 September 2009. Knights are required to have Irish ancestry and follow the Roman Catholic faith. 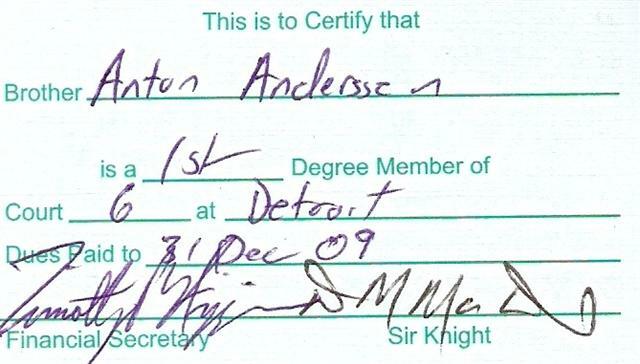 Anton was promoted to 2nd degree on 5 October 2012 at the K of E National Convention in Detroit. The first degree is Known as the HALL OF EMANIA the emblem of this degree is the scales of justice denoting " equity with Justice" and enhanced with crossed swords signifying aggressive determination. The second degree is known as HALL OF CRUCHAN it was a great seminary of learning and the burial place of the Kings of Ulster. The emblem of this degree is the red hand of Ulster of the O'Niell clan, symbolic of our Ulster inheritance and Celtic history. The third degree is known as the HALL OF KINCORA where each candidate is formally Knighted and bestowed the title of "Sir Knight". The emblem of this degree is the Celtic Cross, to remind us of our Celtic heritage and our Christian belief. The fourth and highest degree is known as the HALL OF TARA it was an ancient site near the town of Trim, a place where Kings, scholars, lawyers, and knights resided, constructed by Corman MacArt, the Celtic King. The emblem for this degree is the shamrock and its construction of 3 parts on one stem, signifying the 3 parts of the Holy Trinity.